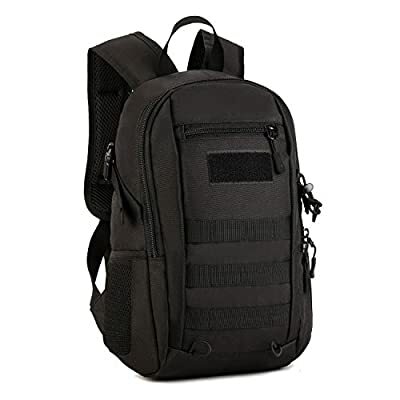 2.Shoulder Strap : max 27.5"
3.MOLLE external expansion system designed to be used in combination with other equipment,you can load pockets, water bottle bag, accessory kits and other. 2.Care:Hand wash with cold water. 4.Packing List: Tactical bag x 1. Dimensions: 9.8"W x 14.6"H x 4.7"D. It is a mini backpack and it is only 10L. Some customer even says tiny. It fits for pupils,school student or small person. Any one who mind the size,pls choose a larger one. Main pocket: fit for iPad4, 10" tablet, Side Pockets: can fit 500ml bottle Front pocket: can fit 5.7" phone. High-intensity military-style specifications nylon, scratch-resistant, Not easy to fade.Waterproof, to ensure the strength of the product while ensuring long-term use in wet environments, or will not rot after the invasion of water MOLLE external expansion system designed to be used in combination with other equipment, you can load pockets, water bottle bag, accessory kits and other Bag's body parts using high-strength nylon buckle, and Baoshen same color, cold, crashworthiness, not cracking, deformation Suitable for fitness, outdoor travel, hiking and other outdoor activities.